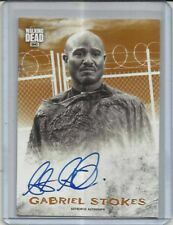 2018 The Walking Dead: Hunters and the Hunted PARALLEL "Autograph Card" SETH GILLIAM (19/99) as Gabriel Stokes. You must have an account to receive this card. 1/1 2018 "The Walking Dead" Hunters And The Hunted (CARL) SKETCH CARD BY: B. Scotchmer. Production and sales on the Walker copper bullion design has ended as of 10/31/13. However, the infection can still spread withProof Zombucks® Walker 1 oz Copper Rounds. Each Zombucks® Walker 1 oz copper round contains 1 AVDP oz of. 999 copper and arrives in undead condition. Topps Walking dead Hunters And Hunted Parallel Lot Of 15 In Great Condition. Condition is Used. Shipped with USPS First Class Package. The Walking Dead STEVEN YEUN as GLENN Auto Card Autograph. Condition is New. See my other Walking Dead stuff for sale. 2017 Walking Dead Season 7. Autograph Auto ADC-2 Alycia Debnam-Carey. 2018 Topps Walking Dead Hunters & Hunted Daryl Dixon SKETCH CARD 1 OF 1 Very Detailed, by Rees Finlay. Flash is on in pic 2 to see darker detail. No returns. KING EZEKIEL AUTHENTIC WARDROBE RELIC CARD R-KE. HUNTERS AND THE HUNTED ---. This Factory Sealed HOBBY Case includes EIGHT(8) MASSIVE Factory Sealed HOBBY Boxes! Total of SIXTEEN(16) HITS includes (8) AUTOGRAPHS in this 8 Box Factory Sealed HOBBY Case! New inserts to collect! Walking Dead Topps Hunters And The Hunted Simon Orange Parallel Auto #/99! No returns. It is numbered 89/90. Nice AUTO and hard to find. Check scan for detail. Spots are from scanner. Great addition for the WALKING DEAD fan. 2016 WALKING DEAD SURVIVAL BOX ALANNA MASTERSON TARA CHAMBLER INFECTED /99 Authentic Autograph trading card. Condition: BGS 9.5 GEM MINT AUTHENTICATED (POP 1!). bluray tos original series deep space nine ds9 voyager scifi pop culture william shatner patrick stewart captain kirk. Condition: BGS 9.5 GEM MINT AUTHENTICATED (POP 1!). bluray tos original series deep space nine ds9 voyager scifi pop culture william shatner patrick stewart captain kirk. Card pictured is the actual one you shall receive.Good Luck! HUNTERS AND THE HUNTED --- HOW TO TAKE DOWN A WALKER INSERT CARD SET OF 7 PLUS A WRAPPER --- YOU GET ALL CARDS PICTURED. TOPPS WALKING DEAD EVOLUTION KING EZEKIEL SKETCH CARD BY RYAN CROSBY 1/1! Card pictured is the actual card you would receive and is in excellent condition (any wavy lines are from scanner and not on card). 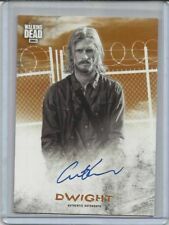 A great addition for any Ezekiel/Ryan Crosby/Walking Dead fan's collection! Card #AC-LT Autograph #'D 24/99. 2016 Walking Dead Season 5 Steven Yeun Auto. Condition is New. Shipped with USPS First Class Package. Card is in excellent condition (card pictured is the actual one you would receive). A NICE addition to any Walking Dead fan's collection! ENID " GREEN " AUTHENTIC WARDROBE RELIC PARALLEL R-E --- SERIAL NUMBERED #d 21/25. HUNTERS AND THE HUNTED---.